This may come as obvious to many politicos that read Lefty's, but I thought I'd share the data reinforcing a powerful relationship in politics. A lot of US national politics can be explained by Urban vs Rural population. It's not the only factor, but the correlation is remarkably strong (happy to share the normalized data sets and R-squared to anyone who cares). The more urban a state's population is, the more people vote Democrat (2012 Presidential Election). Notable outliers were Maine, Vermont, and Utah. Maine and Vermont are extremely rural and reliably Democrat. Utah is surprisingly urban and reliably Republican. 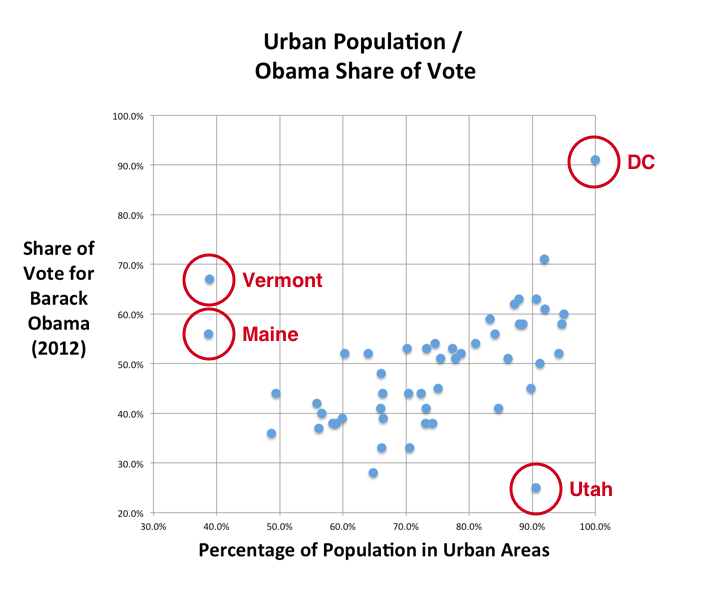 Utah received an especially high share of the Romney vote in 2012, presumably because of the high Mormon population. I'm happy to send the combined data upon request. Rural/Urban data can be found here.